A staple of the film and video industry, the black 6.5' Master 20" Riser C-Stand with Sliding Leg from Kupo is designed to support light fixtures and other grip gear on set or on location. While two of the legs are spring-loaded, the distinguishing feature of this stand is the height-adjustable third leg. By loosening a locking knob and sliding it up and down the main riser section, this sliding leg enables the user to raise one leg higher than the others to accommodate rough or uneven terrain, or to position it in tight spaces. This 20" double riser stand has two telescoping risers and one main section, for a total of 60". The 17.95" base brings its total height to 77.95" (6.5'). The legs nest together for efficacious storage and transport. 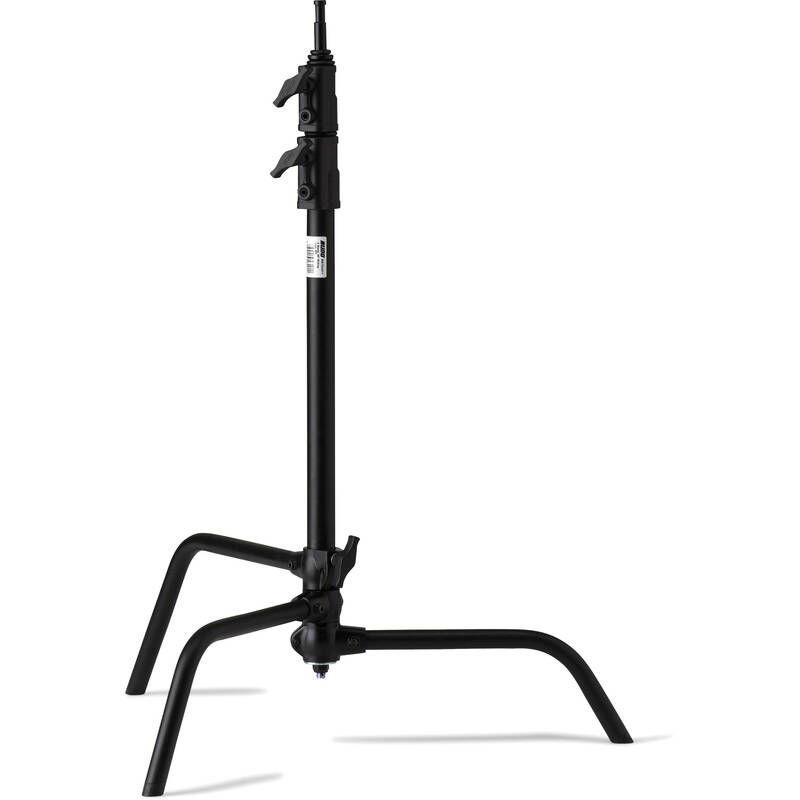 Five times stronger than aluminum, the Master C-Stand's base is made of zinc alloy to sustain the weight of heavy sandbags or other equipment. The aluminum cast locking collars are outfitted with stainless steel Heli-Coil that protects the risers from damage. Box Dimensions (LxWxH) 38.4 x 21.9 x 3.0"
Master 20" Riser C-Stand with Sliding Leg (Black, 6.5') is rated 5.0 out of 5 by 6. Rated 5 out of 5 by fishdream from Good stand Most of my c-stands are Matthews or Modern. I purchased this 20 stand a few days before a job that I needed it on. To my surprise, it turn out to be better than I expected from a non-matthews c-stand. The build quality is solid and sturdy. All knuckles are secure and the riser telescopes smoothly. Rated 5 out of 5 by Shane from Excellent Shorter C-Stand I wanted a second shorter C-stand for my overhead camera rig and this one is perfect. It is tall enough for my needs. It is heavy and heavy duty. It seems well designed and well made in every way. A benefit to the 20” is that it is shorter and a little lighter than the 40” C-stands but just as strong with the same leg base. If you don’t need the extra height of the 40” stand, I would consider the 20”. I wouldn’t hesitate to buy this stand again if needed. Note: I bought the used “demo” version at a lower price and it arrived in perfect condition, just like a new one. Rated 5 out of 5 by Mohamed from Quite a surprise! I own several c-stand, wanted one short so I can secure lights coming from below. The stand is light and solid which makes it ideal to take outside for photo shoots. Definitely buying a second one. Rated 5 out of 5 by Michael from I recommend having both the 20 and 40 riser models I own several full-size C-stands from both Kupo and Matthews. From time-to-time I have needed shorter C-stands with boom arms. I recently purchased a Kupo Master C-stand with a 20 riser, and can safely say that I will be buying more of them. In my studio I find that its nice having a mix of both the 20 and 40 riser models to work with. Whats especially nice is that Kupo C-stands are the same quality as Matthews C-stands, but are priced considerably lower. Rated 5 out of 5 by Robert J from Very professional and sturdy equipment. The 20 Riser C-Stand (with sliding leg) is a tank. Very well build, and super sturdy. It holds my Flashpoint 600BM and Parapop 38 SoftBox easily. As with any commercial lighting situation, you want to make sure that everything is locked down and secure, due to the chaos behind the scenes, so I make sure that all stands are weighted down with sandbags as well, as an extra precaution. Rated 5 out of 5 by Anonymous from Fantastic Product! I'm specifically using two of these for my dolly slider. They hold it up perfectly and there isn't any unnecessary movement when I work the slider. It was also much longer then I expected which is a plus. Nice solid product.